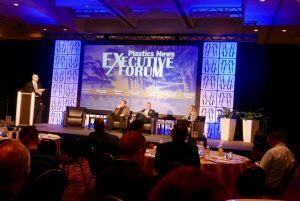 Karen Paulson, president of Paulson Training Programs, Inc., participated in a panel discussion at the Plastics News Executive Forum, held in Naples, Fl in March of this year. The discussion centered around workforce development issues and was titled, Mentoring/Training to Attract the Next -Generation of Workers. The discussion was moderated by Plastics News editor Frank Espisito. Karen was in good company on the panel sharing it with SPE’s new CEO, Patrick Farrey and Tom Barr, President of TK Mold and Engineering Inc. Workforce development is a hot topic for the plastics manufacturing industry and each panelist sought to showcase how their individual company/organization efforts contribute to engaging the new plastics professional. Karen pointed out in her talk the importance of establishing a solid training program. By doing so company’s can appeal to both potential new hires and existing employees their commitment to employee success. Karen hit home the idea that training is an excellent tool for recruiting, retaining and advancement.